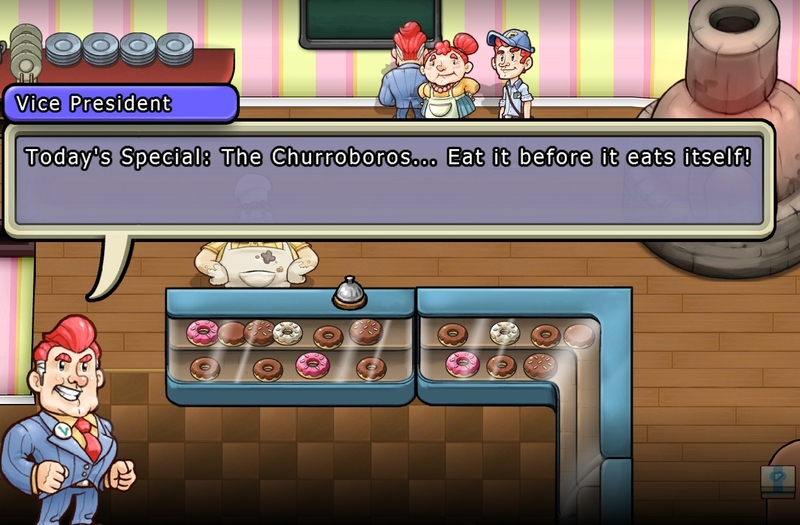 Citizens of Earth: An RPG in the key of EarthBound | Action Points! I’m only a few hours into Citizens of Earth, and already I’m overjoyed. EarthBound lives on! It’s no secret that I’m a huge fan of the Mother Series (EarthBound being the second entry) and Eden Industries’ turn-based RPG set in modern America is a tribute not just to EarthBound‘s sense of humour, but also its design sensibilities. Instead of the pixel art of EarthBound, we have crisp HD sprites. 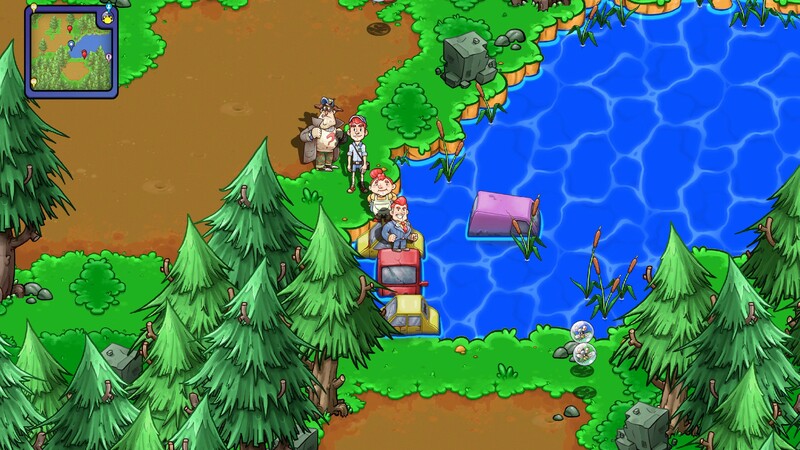 Citizens of Earth is presented in the same broken perspective as EarthBound with flat sprites that appear to be standing front-on to the viewer, while moving in a sometimes top-down, sometimes isometric world. Towns and other environments are littered with NPC’s, all with different agendas, and it’s your job as the newly-elected Vice President of the World to recruit these citizens to fight for your cause. And so far the protagonist’s political platform seems to have been built on his fabulous hair. 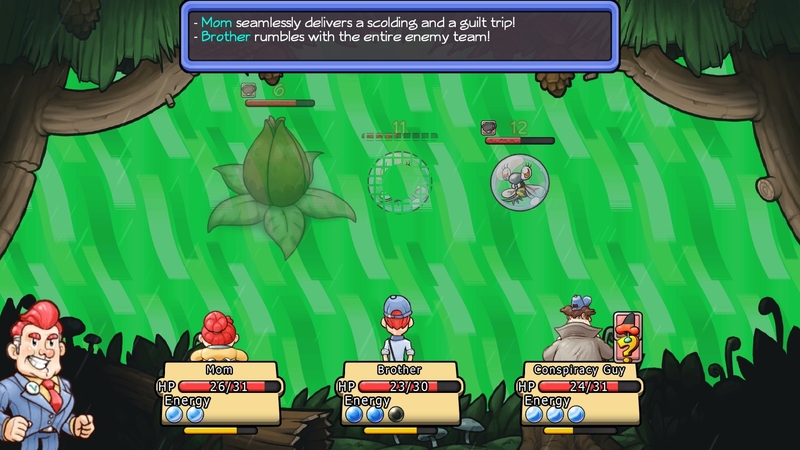 Enemies also move around the environment, in the style of EarthBound, instead of a random encounter system popular with many top-down, JRPG-style games. Another page from the Mother series book of design is having enemies that react to player characters’ levels by either fleeing when a strong party approaches, or hurtling towards a weaker party as you move through the world. Battles can also be auto-won if the player is of a sufficiently high level. Eden Industries’ policy of keeping tutorials to a minimum pays off and within minutes of starting up the game you’ve recruited your brother (who works for the postal service, FedUPs – in EarthBound the protagonist’s older sister held the same job) and your mother to fight their way to the bottom of a conspiracy regarding the coffee chain, Moonbucks™ and their latest über-addictive blend. Battles play out in a very similar way to EarthBound. The energy system is simple to use, with attacks and abilities either adding or subtracting from the small pool of each character’s energy. Some attacks require multiple energy balls and new abilities are learned every few levels. Standard healing, status changing and focused/spread damage abilities are all themed around the party member’s role – for example, the local conspiracy theorist can uncover dirt on the opponents and store weaknesses and statistics in his almanac. Status effects like confusion and sickness don’t require antidotes, as they wear off after a certain number of turns in battle. The warping coloured backgrounds and humorous battle text match closely to its Motherly inspiration. And speaking of puns, prepare yourself for the return of the pun animals! From Bubblebees (bees in bubbles) to Telefawns (part deer, part telephone) to a Honey Bear (a bear made of a giant honey squeeze bottle), you’ll immediately recognise the EarthBound-inspired wordplay chimeras. And that’s just within the first hour! The theme of vapid patriotism works well and closely matches the adults-are-usually-idiots vibe of EarthBound. 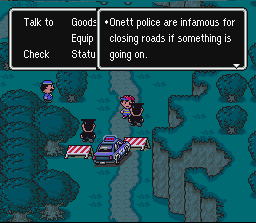 As you can see, even the text boxes are a higher resolution version of EarthBound‘s. 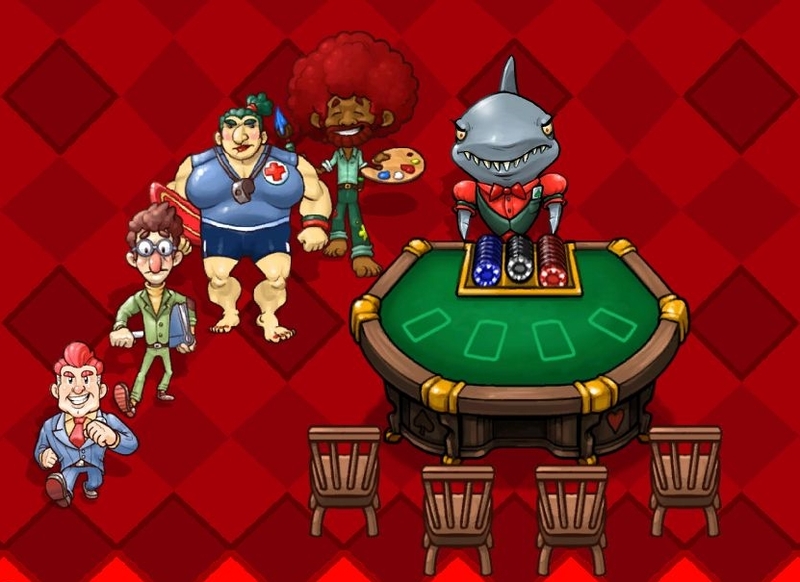 The key element that sets Citizens of Earth apart is its party management system. People will join your party as you work to improve their lives, acting as their elected representative. And it seems they’re willing to get into actual, physical combat for you. Characters you’ve collected can be stored in the school so they can gain levels and attend classes while you’re out commanding your immediate party of followers. Extra seats in the classroom can be unlocked, and managing the strengths of your party becomes the aim of the game. Citizens of Earth is published by Atlus and was released on the 20th January 2015. It is available on PC (Steam), PS4, PS Vita, Wii U, 3DS for less than $15 USD. If you’re after an Earthbound experience, perhaps pick it up on one of Nintendo’s platforms. I’m very tempted to buy it again once my New 3DS XL Majora’s Mask Edition arrives. I’m thoroughly looking forward to sussing out as many EarthBound references as I can. I’m on a mission to transform every location I visit, both physical and digital, into a shrine to Itoi Shigesato. Join me. Eden Industries is certainly on board. I downloaded this the other week for the Vita. I’m digging the humor, but the gameplay hasn’t hooked me.